Two new photos from Half-Blood Prince have been released, sent by an anonymous email tip. They show Harry and Ginny in the reeds outside the Burrow; and the Hogwarts staff and students standing outside the school. The images can be seen in our galleries. Harry Potter and the Half-Blood Prince will be released July 17, 2009.
and Hermione & Co are standing in the courtyard and no battling ? Woooot!!! I always love new pics!!! Especially those with Ron and Hermione! Awesomest Person EVERRR. 70% Crazy, 30% Sane, and 100% Me!!!! these are awesome pics.... what's going on in the second one? The second pic corresponds with the scene in the International trailer, where a hand holding a wand shoots a lightning bolt into the sky as the camera pans over a huge number of students gathered in the courtyard. I have a feeling it is when Dumbledore has died. Something to do with that. Cool! More pics, though at this rate I'll have seen the whole movie through stills by the time July comes! Yeah..the mysteriousness which we first had was so much more..mysterious Know we know half the film.. I think McGonnagall might be casting a spell to protect the castle or something..
From all the leaked scripts, and the test screening thingys, the second picture is after Dumbledore's death and they are all standing there. 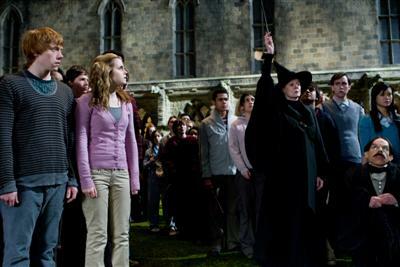 Then McGonagall raises her wand and lights something up in the air, and then the students do the same. And the camera view is then switched to the top to see all of their lights from their wands. That's what I know so far. It's probably not that specific or correct, but I think you all understand. Can't wait for the hi-res ones! in the second picture, is that Cho standing next to Neville? when does the 1st picture actualy happen? I don't remember that in the book. It doesn't happen in the book.. In the film, the burrow gets attacked and I think that the pic has to do with that.. I don't think these are coming from Warner Brothers. We won't be getting them anytime soon. is that Cho standing next to Neville? when does the 1st picture actualy happen? At Christmas, the death eaters attack the Burrow. Gasp! I love the pics!